VET has largely been ignored as a player in the innovation system but with its ties to industry it has the ability to help translate new knowledge into the workforce. 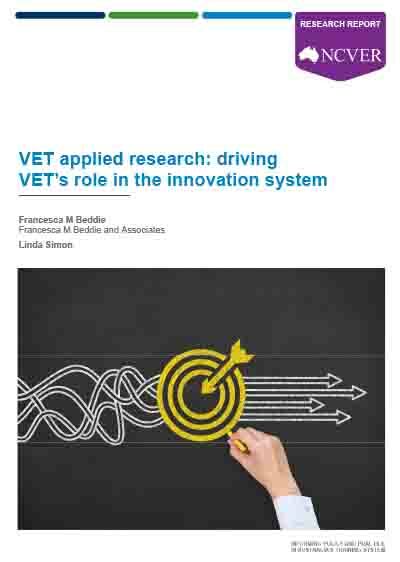 Through discussions with VET institutions, applied research organisations, industry bodies and policy-makers, this research looks at how applied research can help VET to become more active in the innovation system. The report also explores the capabilities that are needed and how registered training organisations and practitioners can build off their existing connections and skills. Innovation has become an increasingly important concept for Australian businesses in enabling them to continue to compete in an international market, but where does vocational education and training (VET) sit in this? To date, VET has been largely overlooked by the National Innovation and Science Agenda as a potential contributor in this field. This research investigates how and in what way VET can contribute to the innovation system. The answer, the authors suggest, is through VET applied research. There is an opportunity for the VET sector to be a contributor to the innovation system through an applied research agenda. In this context, applied research refers to research with a focus on solving real-world problems. Through its ties to industry, VET can play a role in translating this knowledge to the workforce. Registered training organisations (RTOs) do not need to start from scratch to be involved in the innovation agenda: they can build on their existing business models to develop innovation within industries. Other possibilities include capitalising on their infrastructure, expertise and community connections or hosting innovation hubs or enterprise incubators. Many practitioners already possess the skills relevant to applied research projects, but these need to be further developed, either by practising them or by undertaking professional development. The proposed VET applied research developmental framework can help to determine the additional skills needed. adopting elements of the Canadian Applied Research and Innovation Services model to strengthen connections between VET providers and small- and medium-sized enterprises (Recommendation 29). The accompanying documents, Developing VET applied research: steps towards enhancing VET’s role in the innovation system and Explaining the VET applied research developmental framework, provide further insights into how the VET sector can be involved in applied research and the capabilities required. This project examines the vocational education and training (VET) sector’s potential for applied research and innovation and presents a roadmap towards increasing the sector’s participation in the national innovation agenda. Central to this participation is the capability to identify, nurture and impart the sorts of skills Greenspan identifies and which we have called ‘applied research’ skills. Our definition of that descriptor draws on terminology used in the innovation literature, as well as on Boyer’s expanded ideas of scholarship (1990) and Stokes’s depiction of use-inspired basic research (1997). In essence, we are talking about research with a focus on solving real-world problems. Such activity can create new knowledge, and/or use existing knowledge in new and creative ways. In our explorations into how the VET sector could realise its potential in this area, the capabilities of its educators and other professionals emerged as a significant factor, in both pursuing opportunities and in sustaining them as part of the everyday work of the registered training organisation (RTO). We argue that increasing the applied research skills of VET professionals is also one way to revitalise VET’s place in industry policy and workforce development. Our primary focus was therefore on how to develop an applied research capability in the sector, one that could assist in securing a place for VET in the innovation system. To this end we have developed a framework for VET applied research, set out in the accompanying document, Explaining the VET applied research developmental framework. This report, whose findings underpin the framework, draws on the literature and our fieldwork ‒ discussions with VET institutions, applied research organisations, industry bodies and policy-makers, mainly on the eastern seaboard. Our hypothesis was that the current innovation agenda does not fully recognise the role of VET because the sector’s latent potential is not well understood, either within or beyond the sector, and because many in the VET workforce first need to be equipped to play a greater part in the innovation cycle. Our investigation confirms that, despite a strong commitment to professional practice and innovation in many VET organisations, the notion of ‘applied research’ as a part of that practice is at best novel and often alien. Beyond the sector, the idea of VET as a research partner hardly surfaces. There is, however, a foundation on which to build. We outline what is already underway in this area, both in Australia and elsewhere, in particular, Canada. The rationale for these existing efforts is the place VET occupies between knowledge generation and its application in the workforce. This position opens up possibilities for improving Australia’s ability to translate its good ideas into improvements in industry and into higher productivity. Productivity also depends on a skilled workforce. Again, VET’s role in training should position it better than other education sectors to align curricula and teaching methods with the fast-changing requirements of enterprises. Our articulation of the nature and extent of VET applied research skills and their mapping against the Training and Assessment Training Package and other training packages indicate that elements of this capability are already present. Many VET educators and other professionals possess a measure of research literacy and a combination of other communication and management skills for contributing to any team working on an applied research project. But they may need to cultivate these, through putting them into practice, or by attending short courses and other professional development events, or by engaging in further formal education in the VET or university systems. All this activity requires release from other duties; it also demands strong institutional and research leadership to shape and endorse the research effort and to ensure that all members of staff have appropriate levels of research awareness and skills. The adoption of a systematic approach such as this will also lift the research and innovation skills of students, who are then more likely to graduate as the creative problem-solving workers that employers are asking for. and discussions with practitioners, we have identified various ways in which this might work. Our report offers a scaffold of recommendations for RTOs to consider and adopt, depending upon the nature of their business and staffing profile. RedSpace at TAFE Queensland or the Centre for Applied Research and Innovation at Holmesglen Institute, with their dedicated research units may offer one option. Alternatively, RTOs may see themselves as partners with other research organisations or better suited to be knowledge translators and brokers. Another model is to build on physical assets and existing partnerships to become a place-based innovation hub. The accompanying framework (Explaining the VET applied research developmental framework) outlines some of the skills this involves, for example, project management, grant writing, research dissemination. Another accompanying summary (Developing VET applied research: steps toward enhancing VET’s role in the innovation system) discusses organisational capability, as well as the role of the system, in fostering VET applied research. At the moment, much of the VET applied research effort depends on the enthusiasm, industry knowledge and contacts of individuals. Adding to this momentum requires — as does all innovation — a collaborative effort that sees national policy acknowledge the need to support a VET role in the innovation system. Where this has been recognised overseas, it has been accompanied by grants and professional development funding, as well as quality assurance processes and standards setting. The sector itself needs to further champion its achievements and invest in its capability. This would be facilitated by a coalition of peak organisations able to uncover and disseminate existing research and research resources; offer professional development, partnerships and mentoring; and represent the sector at external research, industry and policy tables. The sector has already been exhorted to ‘name and claim’ its applied research. In so doing, it must look outwards and engage with industry to solve real-world problems in real time. Thus VET could become another driver of innovation in Australia.